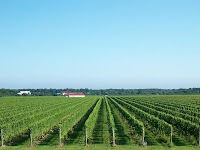 Last weekend was eventful for Dan and me, as we spent it on the North Fork of Long Island, a region known for vineyards. We attended a wedding at the beautiful Raphael vineyard, and then chose to extend our weekend, visiting various wineries and tasting local cuisine. It was super relaxing and I'd recommend it for an impromptu getaway, as it feels like you've left busy New York and entered into a beautiful, wine haven. Martha Clara Vineyards - Next was Martha Clara, which had a very different feel than Diliberto--it was a lot bigger and somewhat corporatey. I later found out that it's owned by the Entenmann family, who also produces the well-known cookies, cakes and doughnuts that many of us grew up eating. We participated in a special wine and chocolate tasting, which for a chocoholic such as myself couldn't be more perfect. The tasting consisted of 5 wines and 5 types of chocolate, starting with light and sweet to very dark and bitter. I preferred the sweeter wines but the bitter chocolate. We even got to meet the chocolatier who made all of the delicious treats--he was from a local dessert company called Chip'n Dipped. 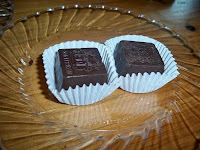 I highly recommend it, especially their darker varieties, some of which contain ganache. After all that wine, we filled our bellies with Long Island's fresh seafood. We stopped at Crabby Jerry's in Greenport, which is run by Claudio's Restaurant. 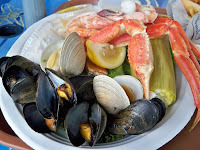 It was a simple, no frills seafood counter, situated right on the water and next to other Claudio's establishments such as the clam bar and the restaurant. 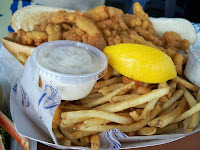 We ordered three things--fried clam strips with French fries, a bowl of steamed seafood as well as Manhattan Clam Chowder. Out of all of these, the fried clam strips and fries were the best. I loved how fresh and salty the clam strips tasted and the batter was wonderfully crispy and zesty, after a nice spritz of lemon. The assorted seafood was good too but it wasn't a great value at $24, as opposed to the amazing deal on the fried clam strips, which were only $8.95 for a generous portion. It was hard to come back to the busy streets of Astoria after this short but tranquil break. With no traffic, it's only about an hour and a half away.